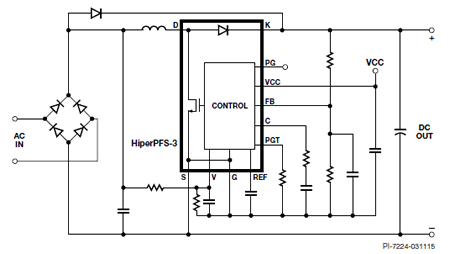 The HiperPFS™-3 family of devices incorporate a continuous conduction mode (CCM) boost PFC controller, gate driver, ultra-low reverse recovery diode, and high-voltage power MOSFET into a compact, heat-sinkable package. The HiperPFS-3 family features a digital enhancer that increases the power factor at highline to >0.92 at 20% load and an efficient "light load" mode of operation which achieves <60 mW no-load consumption. The HiperPFS-3 families' variable frequency continuous conduction mode operation minimizes loss by maintaining a low average switching frequency and by modulating the frequency, suppressing peak EMI. Systems using HiperPFS-3 typically minimize the total X and Y capacitance requirements of the converter and the inductance of both the boost choke and EMI noise suppression chokes, thereby reducing overall system size and cost. 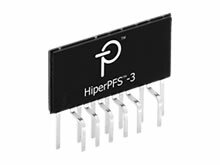 HiperPFS-3 devices require a minimum of external components, saving board space, reducing system BOM cost and the power loss associated with sense resistors.